Holly ‘Heckenpracht’ or Ilex meserveae ‘Heckenpracht’ is a cross between ilex aquifolium pyramidalis and ilex x meserveae ‘Blue Prince’, which itself is a hybrid between ilex aquifolium and ilex rugosa. 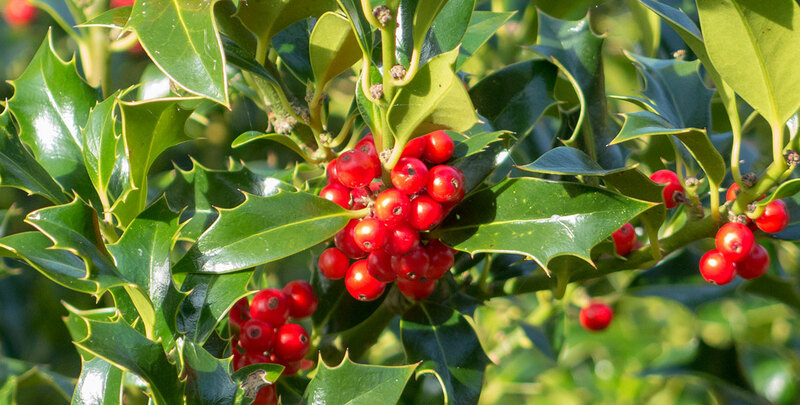 This lovely holly cultivar boasts glossy, dark green leaves, which are softly serrated and not particularly prickly. New growth is light or pale green in colour and appears in spring. The leaves will turn dark green after a while. ‘Heckenpracht’ is a male cultivar with male flowers, which means it does not form any berries. If you prefer berrying holly hedges try interplanting the female cultivar ‘Heckenfee’ with a couple of ‘Heckenpracht’ (or ‘Heckenstar’). Like other hollies, this variety is slow growing (at a mere 30cm p.a.) and low-maintenance, allowing you to keep it as a formal hedge without much effort. It will make a dense, but relatively slender evergreen hedge. This stunning hedging plant is fully hardy and will thrive in any well-drained soil type in sun or semi-shade, with a decent tolerance of deep shade. Trimming once a year is all that is required.